KMouseTool clicks the mouse whenever the mouse cursor pauses briefly. It was designed to help those with repetitive strain injuries, for whom pressing buttons hurts. KMouseTool can eliminate the pain caused by clicking the mouse, and helps many people to use the computer without pain. Unfortunately, some pain can also be caused by simply moving the mouse around the table. If you are experiencing computer-related pain and haven't yet seen a doctor, please do so. 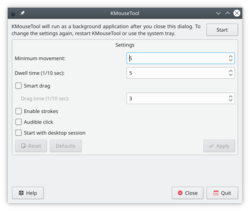 Just to make it absolutely clear: while KMouseTool can help reduce the pain caused by clicking the mouse, it cannot help any pain caused by moving the mouse. And, like all ergonomic tools, your mileage may vary. A full manual helps you through every detail. This page was last modified on 29 June 2011, at 12:40. Content is available under Creative Commons License SA 4.0 unless otherwise noted.